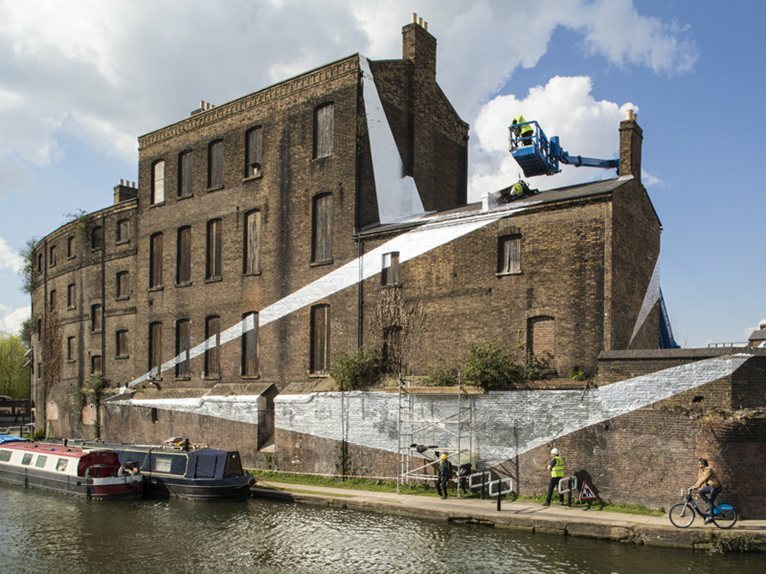 13/05/2013 - Paris-based, Swiss artist Felice Varini has taken the cityscape of King's Cross as his canvas for an intervention onto the façades of the heritage buildings which form part of the area's historic industrial infrastructure. His site-specific installation, 'Across the Buildings' consists of a series of monumental metallic geometric shapes which will run the entire 542 metres of Granary Square north of Regent’s Canal. 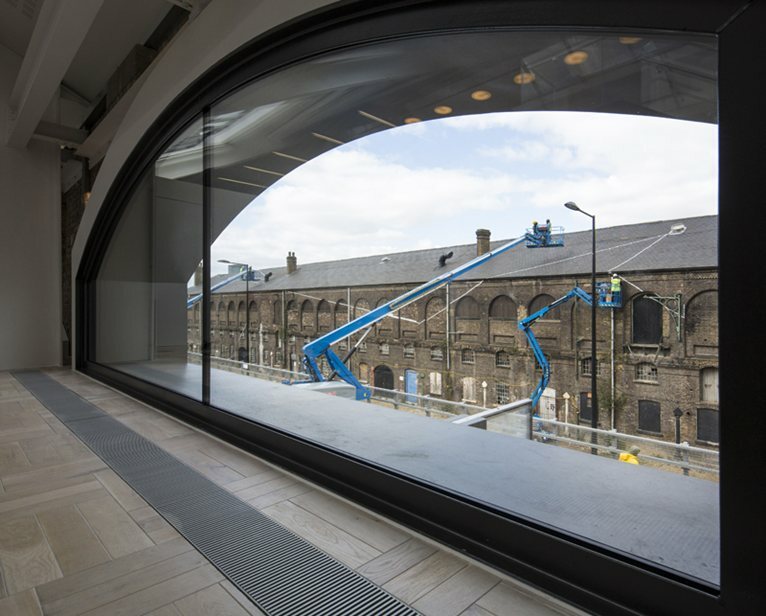 'Across the Buildings' is the third artwork to be revealed as part of RELAY, the dedicated art programme at King’s Cross, curated by Michael Pinsky and Stéphanie Delcroix. From street level, the geometric shapes appear arbitrary, scattered across facades of buildings such as the Fish and Coal Offices, the Midlands Goods Shed and the Granary Building. However from a single and unique viewpoint, the geometric shapes will unify, framing the site into one contiguous pattern. Installation of this colossal artwork will take place over a thirty-day period, Varini's painstaking installation method involves vast night-time projections of the image onto the site by a PIGI camera, transported for the purpose from France. A team of assistants then trace around the projected shapes with a chinagraph pencil, after which aluminum and vinyl is cut to fit the stenciled forms and fixed into place on the building exteriors. ‘Across the Buildings’ is Varini’s first major commission in England. Often referred to as an ‘abstract painter’, Varini intervenes with the space and perception of built environments by creating a unique vantage point in which the viewer can see the complete image, whilst from other viewpoints only fragmented shapes are visible. This unique framing gives the impression that one can 'touch' the buildings from where they are standing. Felice Varini (1952) was born in Locarno, Switzerland. He currently lives and works in Paris. Varini’s latest commission entitled Vingt trois disques évidés plus douze moitiés et quatre quarts was made in situ for the exhibition Dynamo at the Grand Palais in Paris and runs until 22 July, 2013. The exhibition presents a selection of modern and contemporary artworks which have explored the space of the artwork and its relationship to real space. In 2000 Varini was nominated for the Marcel Duchamp Prize. 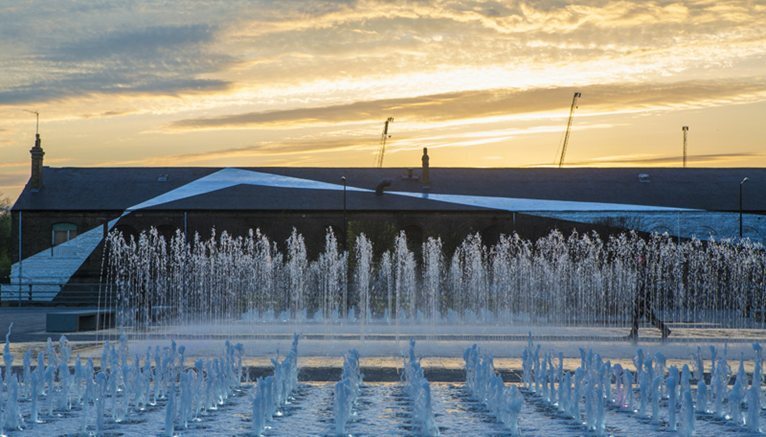 For more information visit www.kingscross.co.uk or follow @kingscrossN1C on Twitter.